Sentinel Ridge Trail Running from Point Lookout to the boat landing, this trail turns the corner from the Wisconsin River to the Mississippi River. Midway along the trail is the Passenger Pigeon Monument and a series of nature labels describing the history of the park (1.6 miles). Sentinel Ridge Trail Loop—There is a .5 mile loop around the Indian Mounds on Sentinel Ridge Trail that is wide and level, providing access to the mobility impaired. Nature labels are also located along that loop. Following is an unofficial trail description for part 2 of the Sentinel Ridge Trail. Click here to see the first section of Sentinel Ridge Trail. Park either at Pigeon Monument or the Wyalusing State Park's boat landing. This section of trail is rated 5-6. Distance 1.4 miles round trip. There are outhouse bathrooms located at the Wyalusing State Park boat landing. No bathrooms are located at Green Cloud Picnic Area or Pigeon Monument. The second section of Sentinel Ridge Trail is marked by an increase in difficulty. The walker will be descending from the top of the bluff to Wyalusing State Park's boat landing – about 500 feet. The trail tread is narrow and made up of dirt and small rocks. This part of the trail does have a long multi-tiered wooden stairway. This is one of two located in the park. A much smaller stairway is found at Treasure Cave. This section of Sentinel Ridge Trail closely parallels the Burlington Northern railroad tracks located below the trail. The last 250 feet of the trail makes a steep descent onto Long Valley Road, about 200 feet from Wyalusing State Park's boat landing. Stop at the boat landing, and walk onto the fishing pier. If anyone is fishing, stop and chat. You will find most are willing to chat and tell stories of the one that got a way. The canoes and kayaks are for rent at the concession stand. Wyalusing State Park is one of few state parks that have a marked canoe trail. 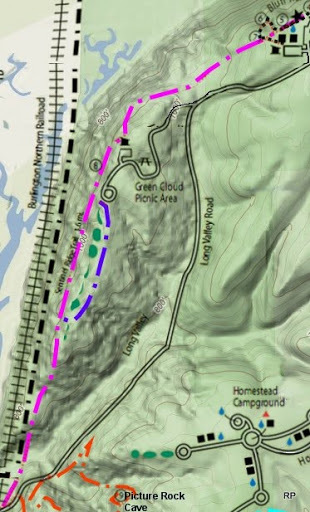 The canoe trail is a loop of 5.9 miles. If this is a round trip, you can either retrace your steps along the trail or walk back on Long Valley Road. Many birders will walk along this section of road in early spring. The road is a long gradual climb. During summer periods, the road is busy with cars pulling boat trailers and others trying their luck at fishing. If you chose to walk the entire Sentinel Ridge Trail, walking back along the road is an option. However, the last 500 feet of the walk is really uphill! At the end of your walk, be sure to stop at the concession stand for a cool beverage and a snack. You have earned it!